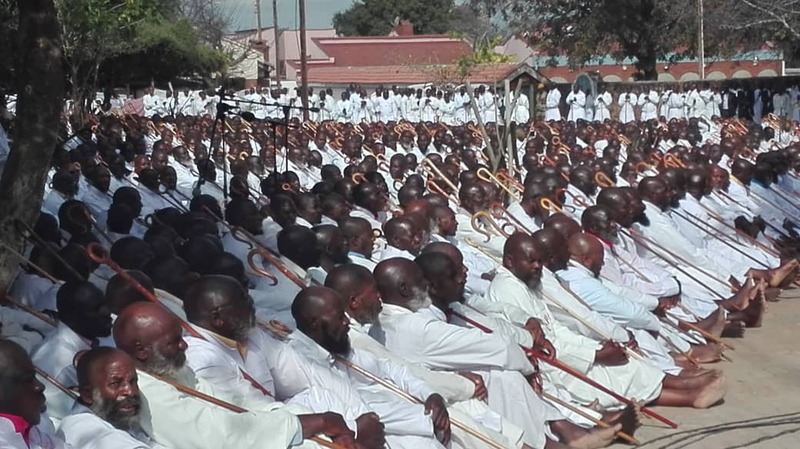 Members of the Johane Marange Apostolic sect have “anointed” and “proclaimed” President Emerson Mnangagwa as the chosen leader post the July 30 elections saying even his rise to power in November last year was written in the spiritual realm. Speaking during Mnangagwa’s visit to their shrine in Marange today, Apostle Abel Chimbadzo, one of the church elders assured the Zanu PF Presidential candidate of victory in the forthcoming elections as ‘he had already been anointed’ and to lead Zimbabwe. “Mr President, you can even go back and stop campaigning because you have begged the trophy already. There is nothing that this man (Noah Taguta, leader of the church) says and does not come to pass. My appeal to you is that please keep his word in good faith,” said Chimbadzo. He took a satirical dig at former president, Robert Mugabe whom he said lost focus at the end of his 38 year reign. “Samson, when he sat here, he was ordained to be a leader, he was given garment and a holy staff (rod). When he went back to his land , he gave the staff to his wife Delilah. He surrendered his power to the woman. “As a clever woman, she knew there was power in the staff and she took it during the night and the husband looked for it in the morning but couldn’t find it,” said the church elder. “So today we are saying Mr President, you were a wise soldier who learnt from his predecessor. You learnt from his mistakes. The star you got here today signifies leadership. It’s called the star of David which stands for the name of Israel…,” added Apostle Chimbadzo. Another church elder, Edmore Muchirawehondo, said Mnangagwa should not involve a woman in his reign as he would suffer the same fate that befell Mugabe. “The former President who was deposed was removed because he allowed a woman to take the lead. This church does not allow women to lead. If you (Mnangagwa) want to be a leader of this country, then don’t allow a woman to ruin it for you ” said Apostle Muchirawehondo. The Apostolic churches have been one of Zanu PF’s biggest support base since independence with various sects including Johane Marange, Vapostori veAfrica and the late Mudzidzi Wimbo congregation taking turns to deliver favorable prophecies to party leaders.